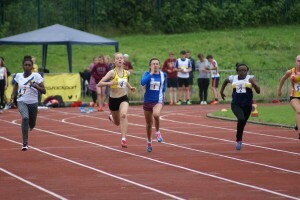 The rain held off and the athletes had pretty good conditions for the final fixture in this years YDL Lower Age Group at Stockport. For a number of the athletes involved, this year has been their first year in competition and whilst hard at times for those who are also bottom of age, the experience they have had will hold them in good stead. 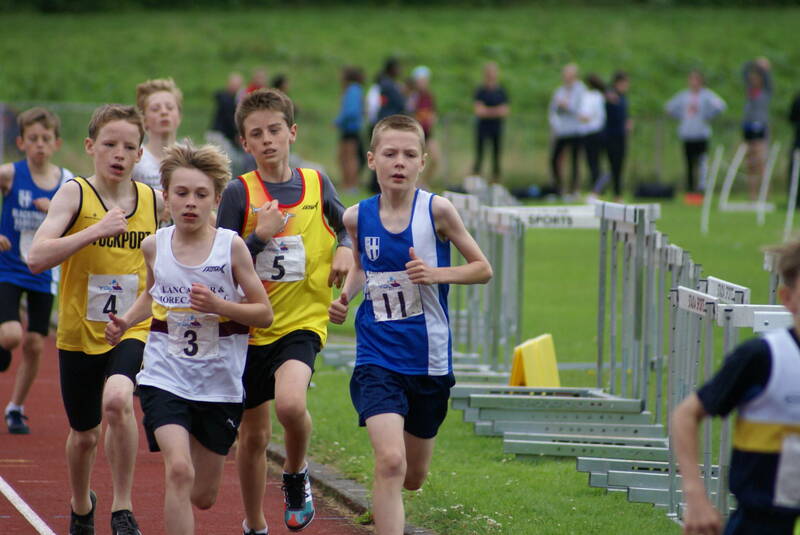 Fixture after fixture, these youngsters really get stuck in and once again they collected 16 new personal bests and a new Club Record on the day. 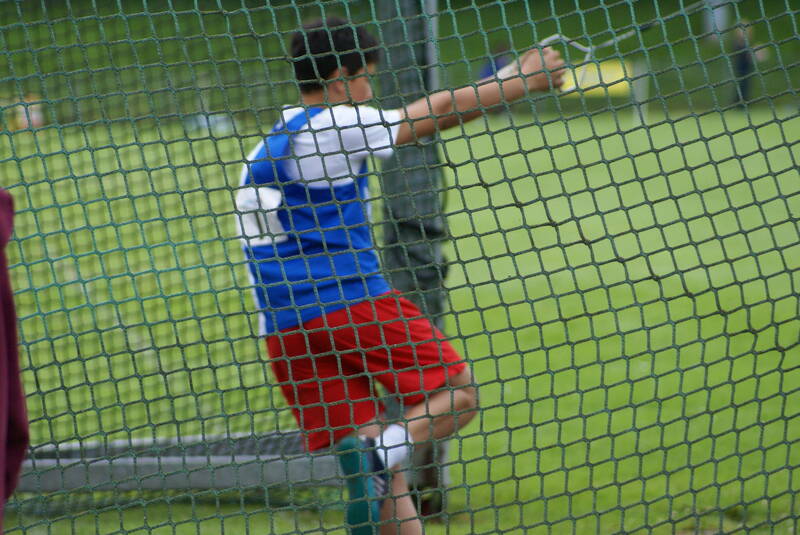 Another win double for U15 Alex Bernstein kicked off the meeting winning the Hammer ‘A’ with a throw of 35.76m and the Discus ‘A’ with 30.09m. 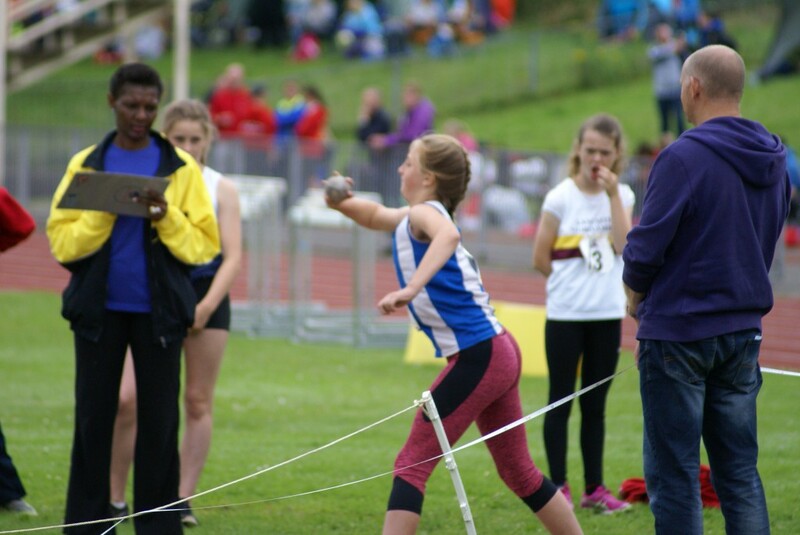 Myah Booth won the ‘A’ U13’s Shot Putt with a Throw of 9.27m which was a new PB and a new Club Record by one centimetre whilst Nicky Saunders came 3rd in the ‘B’ also with a new PB of 6.32m, an improvement by over half a metre. 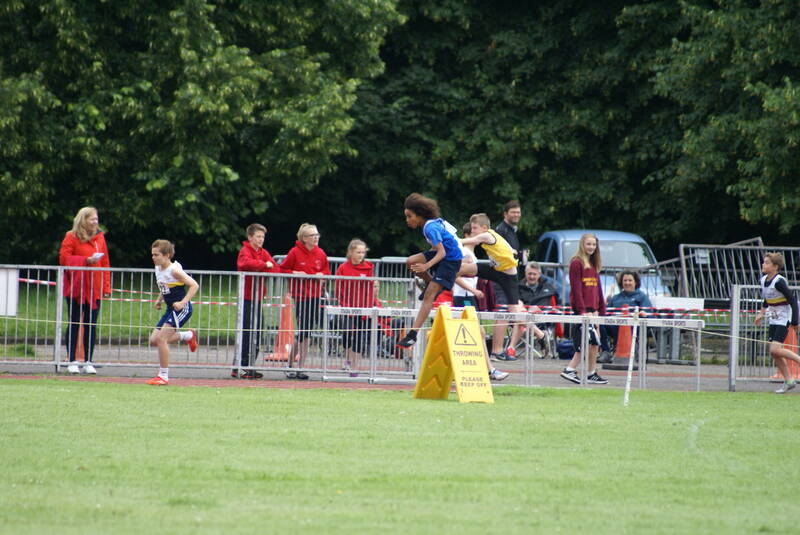 Nicky then went and won the ‘B’ Javelin with a throw of 13.68m whilst Myah came 4th in the ‘A’ (15.79m). 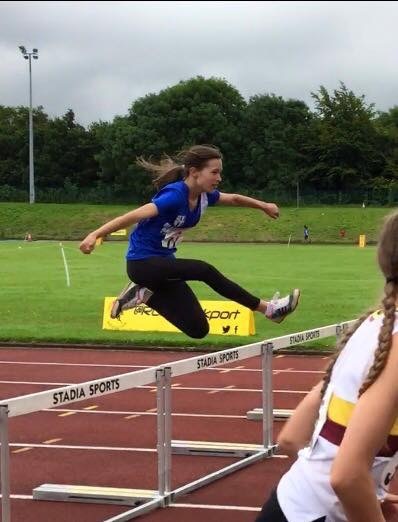 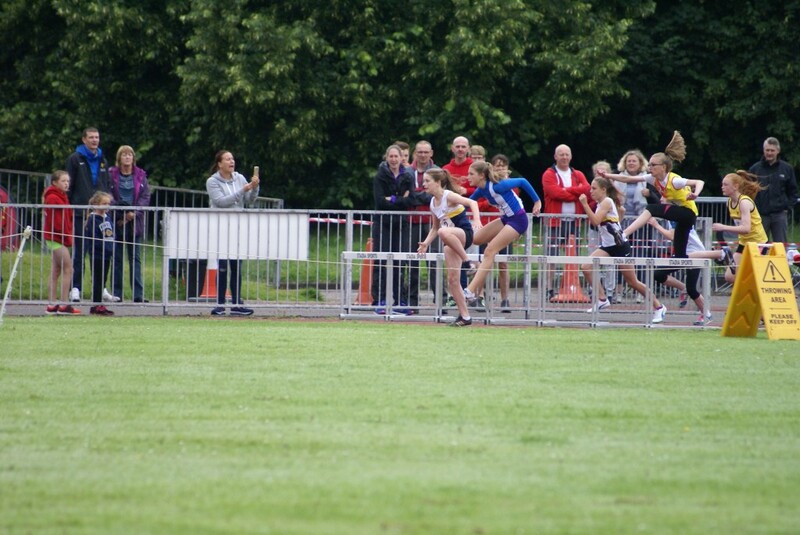 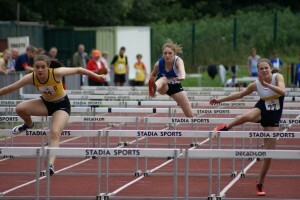 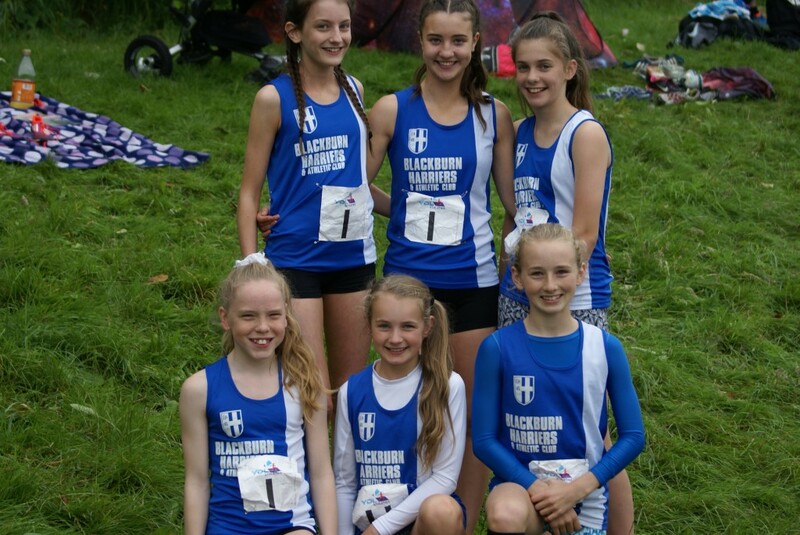 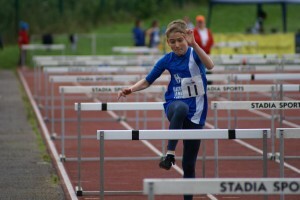 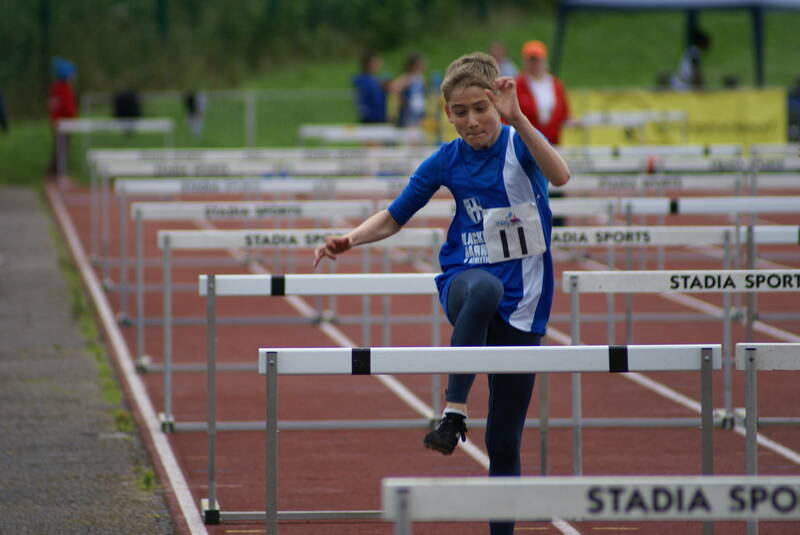 In the U13 70m Hurdles Myah Booth set another new PB and another Club record when she finished 2nd in 11.8 – the same time as given to the winner and she was backed up by another new member in her first season and only her second Hurdles Race – Emma Love – in the ‘B’ coming home in 5th spot in a time of 13.7. 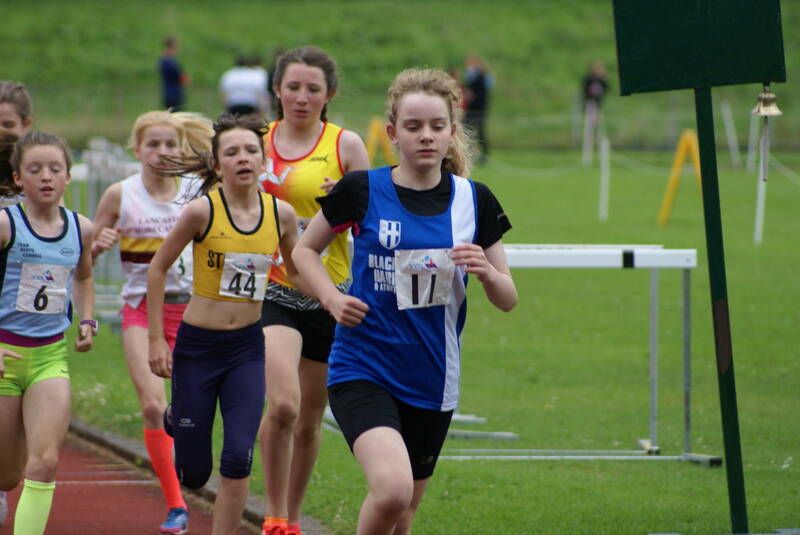 Special mention and a well done to Emily Raine who was very nervous beforehand, cleared 1.70m in the U15 Pole Vault at her first ever competitive attempt in the event. U15 Emily Warren answered the Team Manager’s call to fill in on the Shot and surprised herself with a 4th placed distance of 7.98m, a new PB by a metre and half and she was backed up with a 2nd in the ‘B’ by Charlotte Richardson (7.80m) and a new PB for her by well over half a metre. 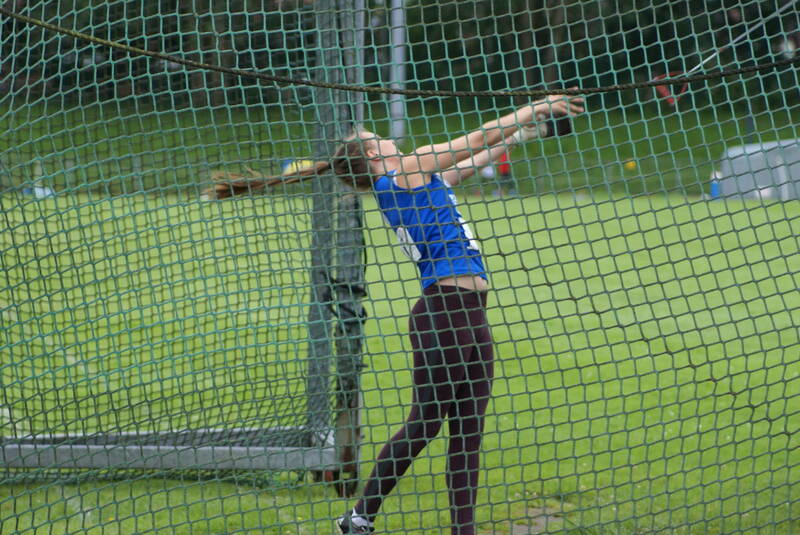 In the U15 Hammer Charlotte Williams – English Schools Silver Medalist – was out on her own winning with a throw of 52.88m and then took a 3rd placed 20.66m in the Discus. 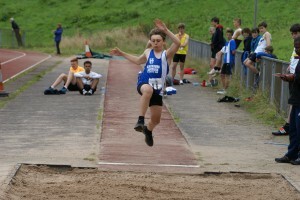 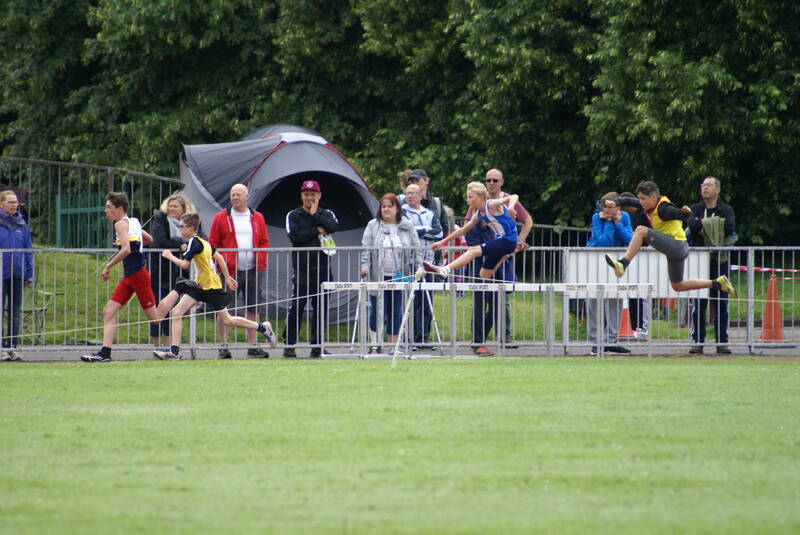 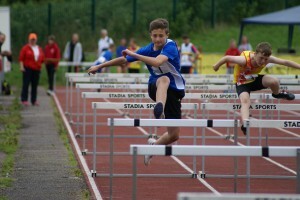 U13 Kieran Carroll came 3rd in the ‘A’ Javelin (17.98m) and 6th in the Shot Putt with 6.24m, just one cm short of his PB. 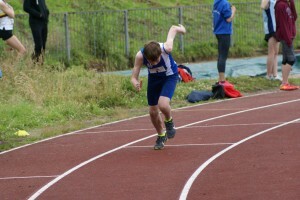 George Whittaker won the ‘B’ Javelin with a throw of 16.13m whilst Ethan Barbarewicz had a go at the Shot Putt ‘B’ for the first time ever and placed 5th (4.64m). 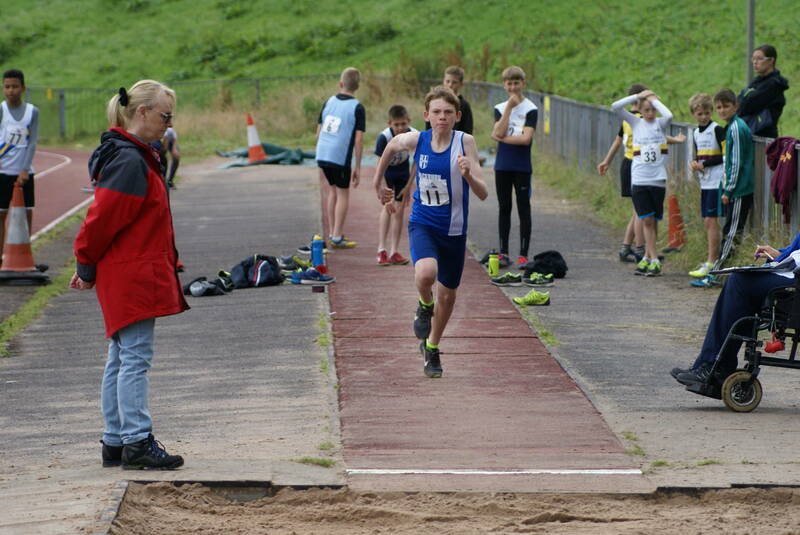 Cameron Harris (U15) doubled up in the Javelin (5th) with 23.59m and 6th in the Shot Putt with 7.73m whilst Joseph Greenough in his first competition for the Club threw 15.65 in the ‘B’ Javelin (5th) and Bradley Meikleham threw 6.78m in the Shot Putt (4th). Ben Whittaker set a new PB in the U15 100m, bringing his time down from 13.00 to 12.8 (4th) with Harry Jackson 6th in the ‘B’ (16.3). 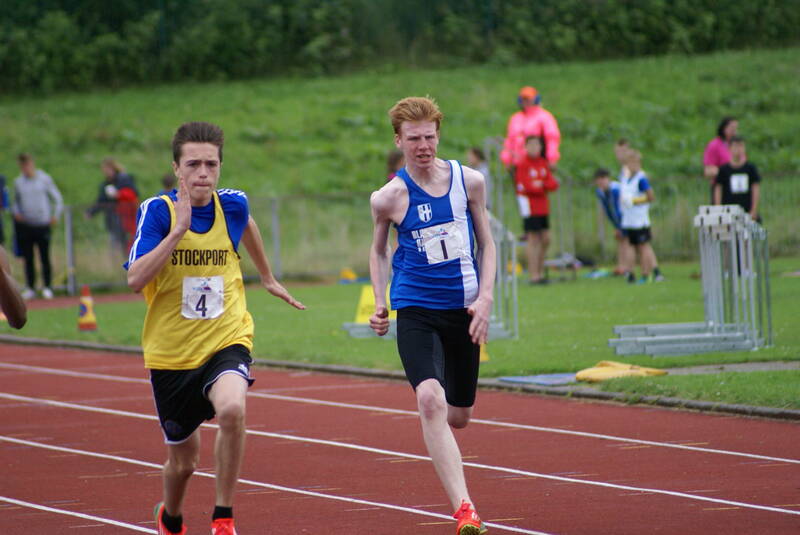 In the 200m ‘B’ Ben placed 5th with 26.6 whilst 800m runner Leon Thomas helped the club out running the ‘A’ 200m (7th) in 29.9. 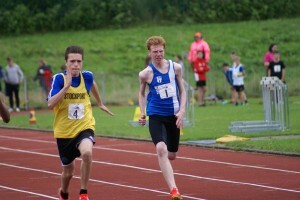 Leon then teamed up with 1500m runner Matt Ramsden in unfamiliar territory when they filled in for the 300m, Matt running 47.7 in the ‘A’ (7th) and Leon 48.7 in the ‘B’ also 7th. The U15 Boys 800m was a very good race with Leon Thomas running just half a second slower than his PB and still finishing 7th in 2.21.0. 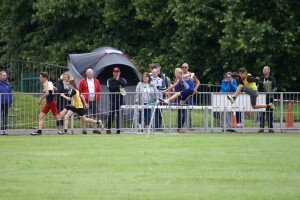 The winner ran 2.10.1 with the next three all recording times of 2.13.2, 2.13.5 and 2.13.9. 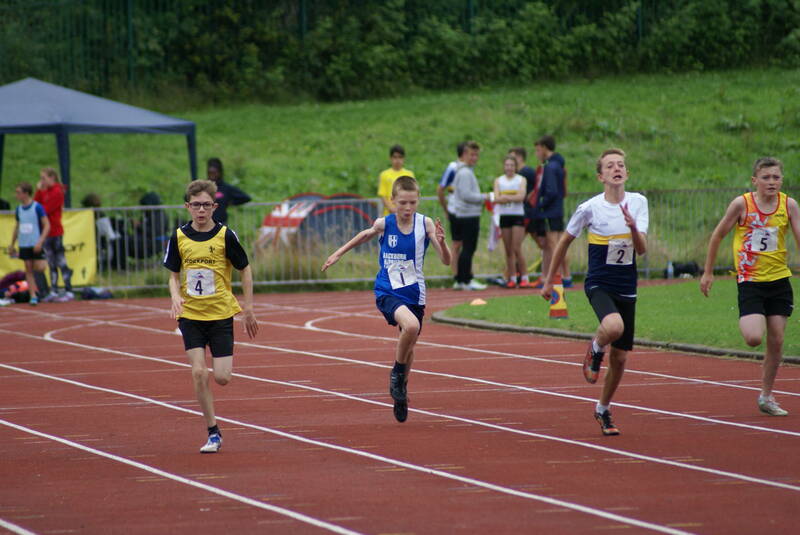 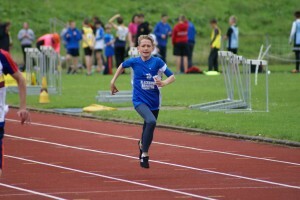 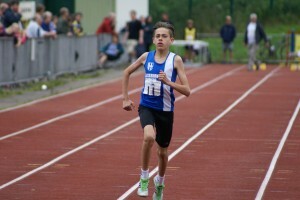 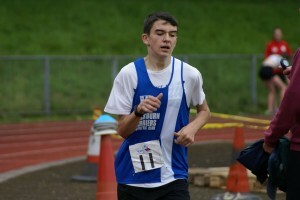 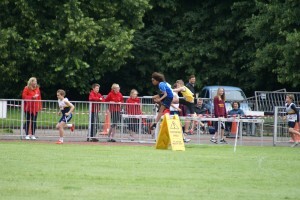 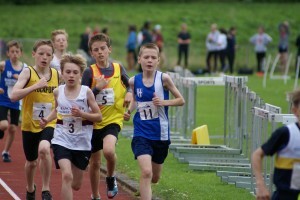 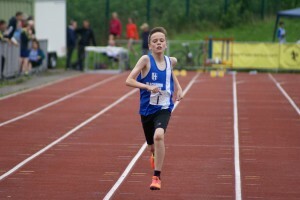 Matt had never run an 800m Race before and came 4th in the ‘B’ with 2.21.7. 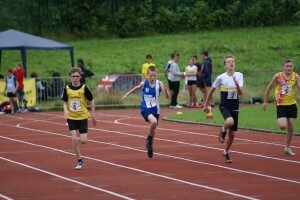 A great effort by both lads in good quality races. 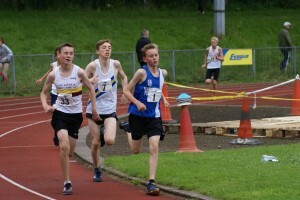 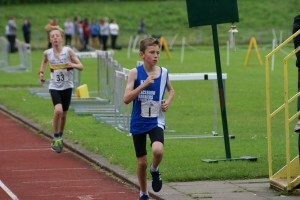 In the 1500m ‘A’ Race U15 Jamie Teare set the latest of a series of new PB’s he has set this season posting a time of 4.42.9 (6th), reducing his previous best by four seconds with Bradley Meikleham supporting in the ‘B’ in a time of 5.09.9 (5th). 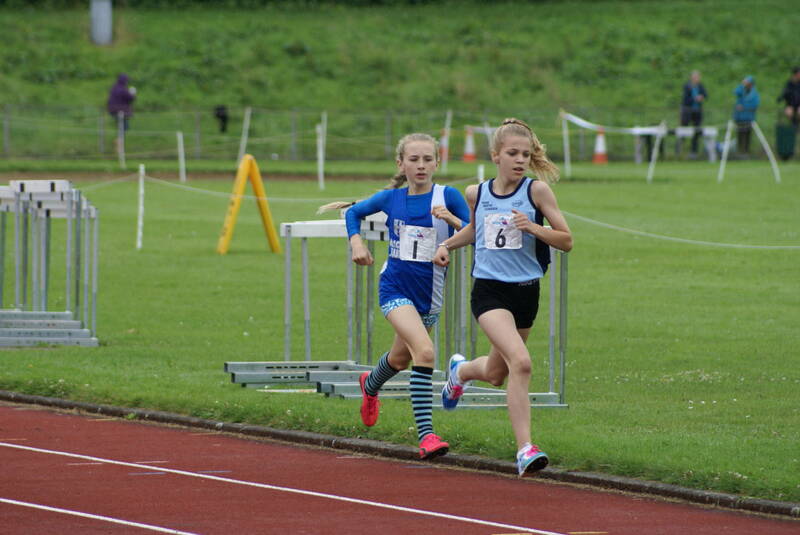 Liberty Thompson ran 2.45.3 in the U15 800m whilst Amy Davies clocked 5.10.7 in the 1500m whilst in the U13 Middle Distance races Charlotte Corrigan came home 3rd in the 1200m ‘A’ in 4.19.9 after setting off a touch fast and Ella Hardman posted a time of 4.44.7 (5th) in the ‘B’. 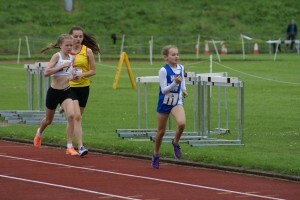 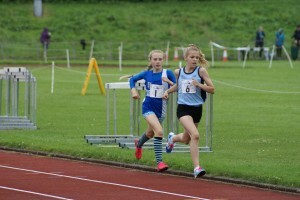 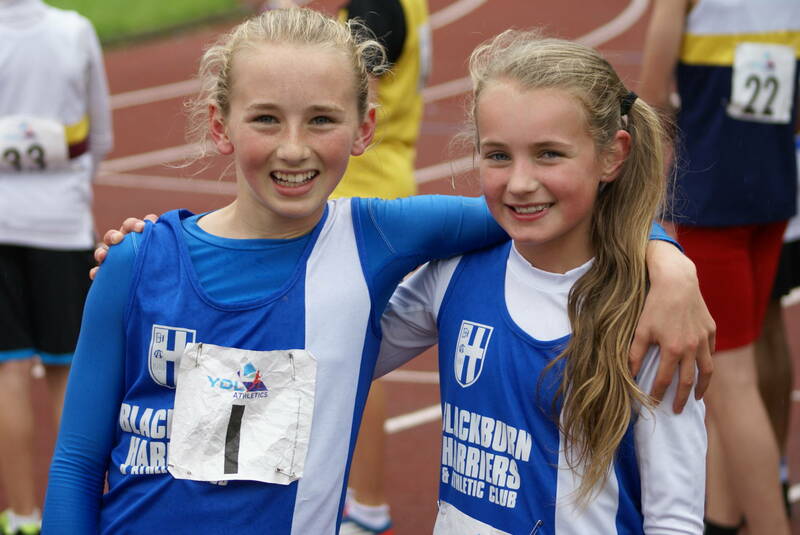 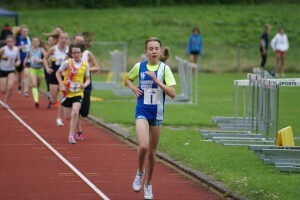 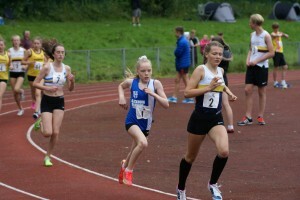 For Eleesha Charnley and Leah Hoole it was a double celebration in the U13 800m race. 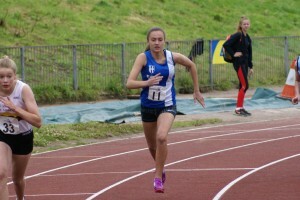 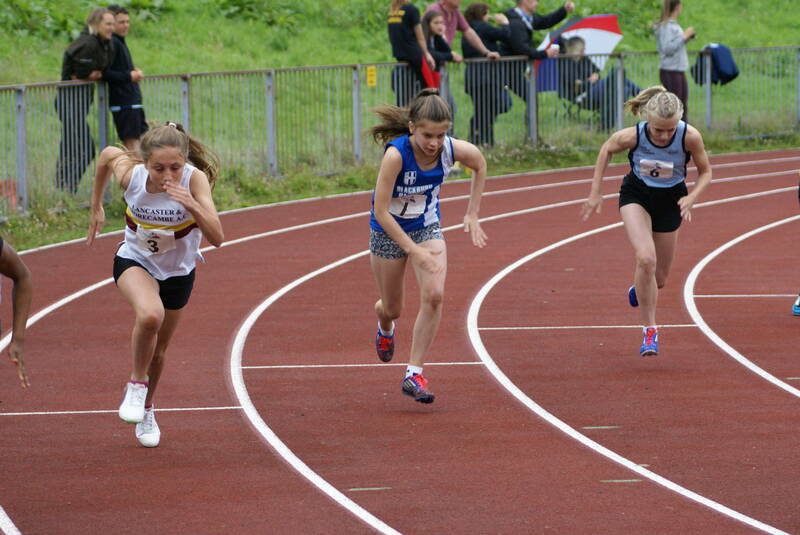 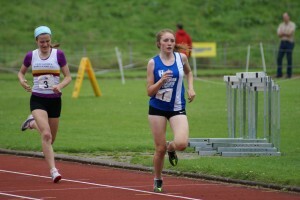 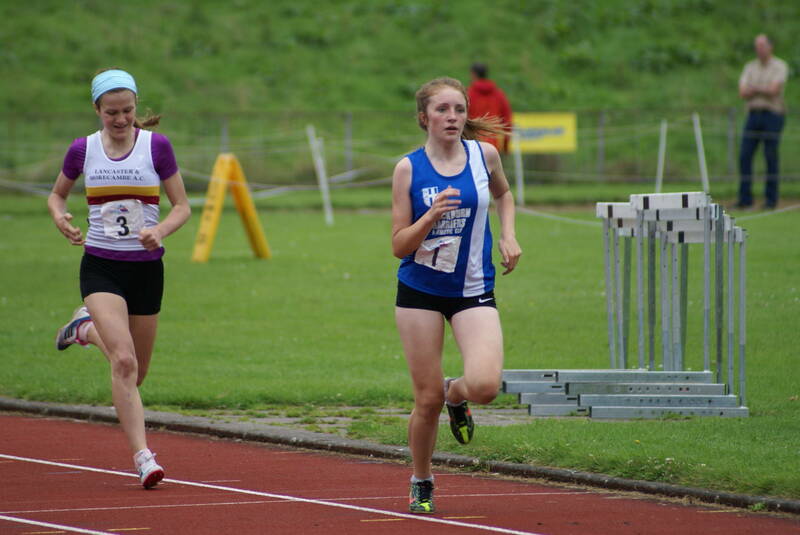 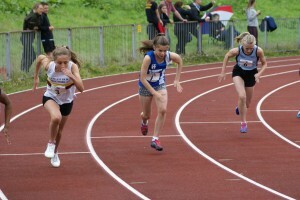 Eleesha came 3rd in a new PB time of 2.32.8 whilst Leah also came 3rd in the ‘B’ setting herself a new PB of 2.41.0. 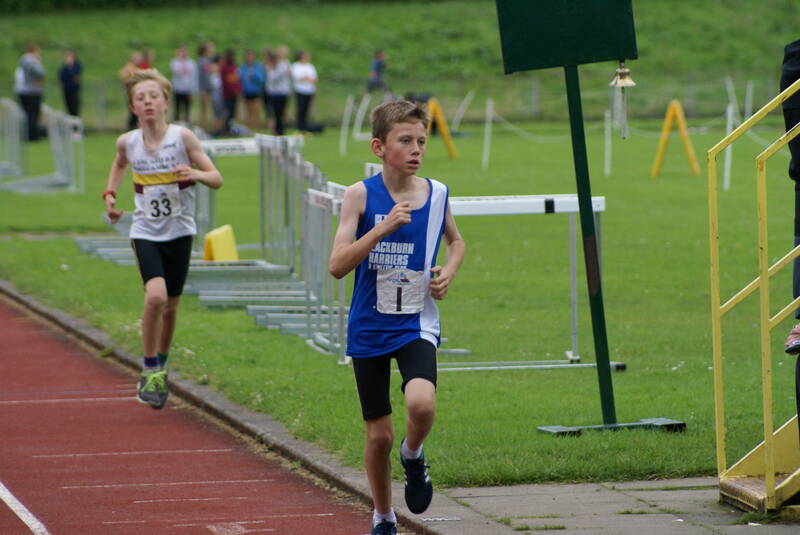 In the U13 Boys Ethan Barbarewicz set a time of 5.22.3 in his first ever trip over 1500m and Kyle Taylor-Pomfret running in the ‘B’ came in 3rd (5.24.0). In the 80m U15 Hurdles, Solomon Brown was having a great race until he stumbled at the last hurdle to finish 7th in 19.0 whilst Harry Jackson set a new PB by four tenths in the ‘B’ running 16.8 in 3rd spot. 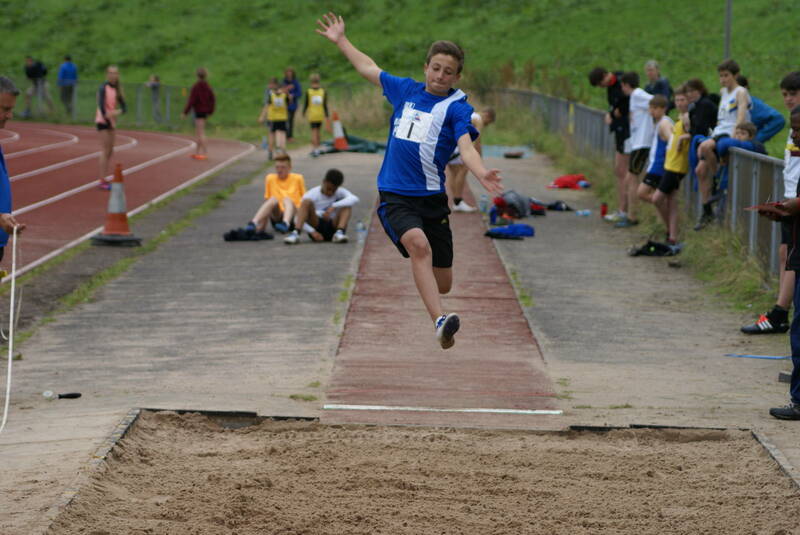 Solomon then Long Jumped 4.19m in the ‘A’ with Joseph Greenough in his first ever attempt at Long Jump reaching 3.18m in the ‘B’. 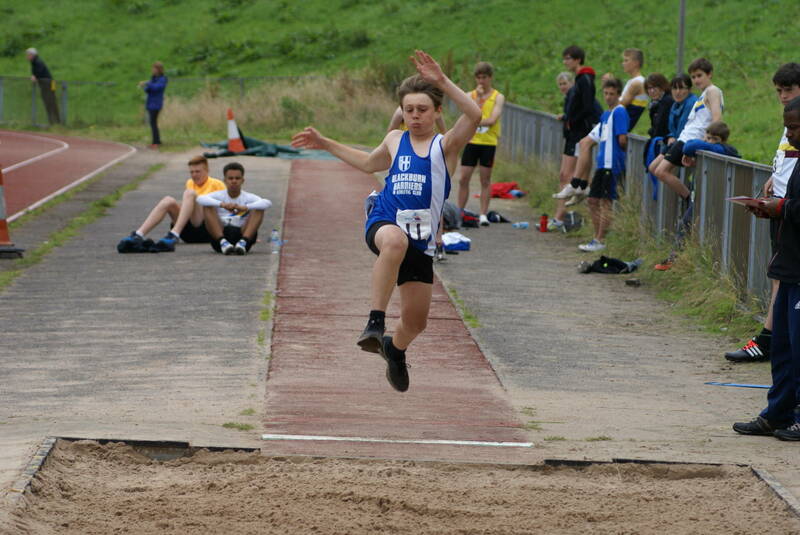 Jayden Brammer added 30cms to his Long Jump to set a new PB of 4.13m (3rd) with George Whittaker reaching a distance of 3.12m for 6th place. In the U13’s 75m Hurdles Rory Teare ran 15.1 in the ‘A’ for 4th spot whilst Jayden Brammer came home in 2nd place in the ‘B’ with a new PB time of 14.9 which chopped a huge 1.6 seconds off his previous best. It was a cracking Race in the U15 Girls 75m Hurdles ‘A’ with Emily Warren placing 2nd in 12.1 and Liberty Thompson 5th in the ‘B’ with a time of 14.7 just a tenth outside her PB. 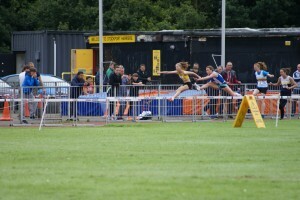 In the High Jump Jamie Teare cleared 1.35m (6th) in the ‘A’ where the first two cleared 1.70 and 1.75m! 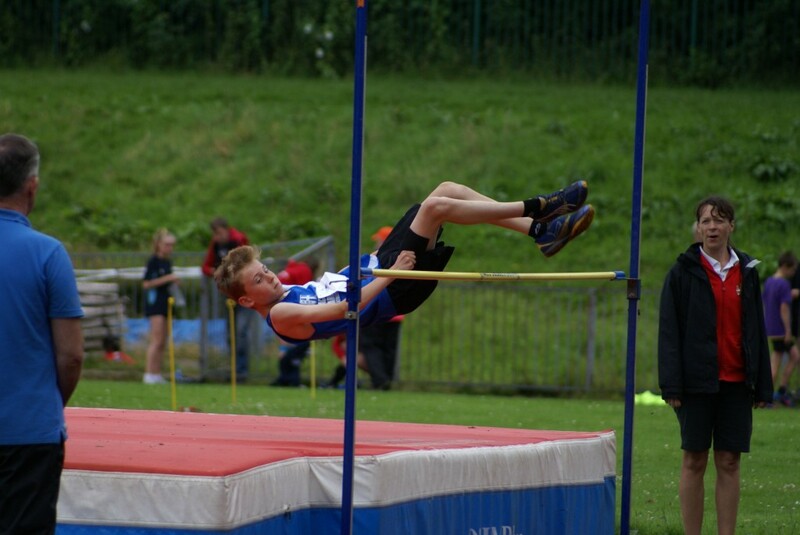 Brother Rory Teare cleared 1.20m (6th) in the U13 High Jump whilst Nicky Saunders finished in 7th place in the U13 High Jump (1.05m). 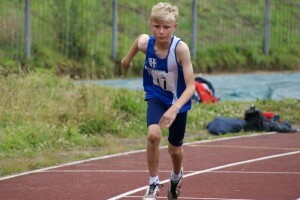 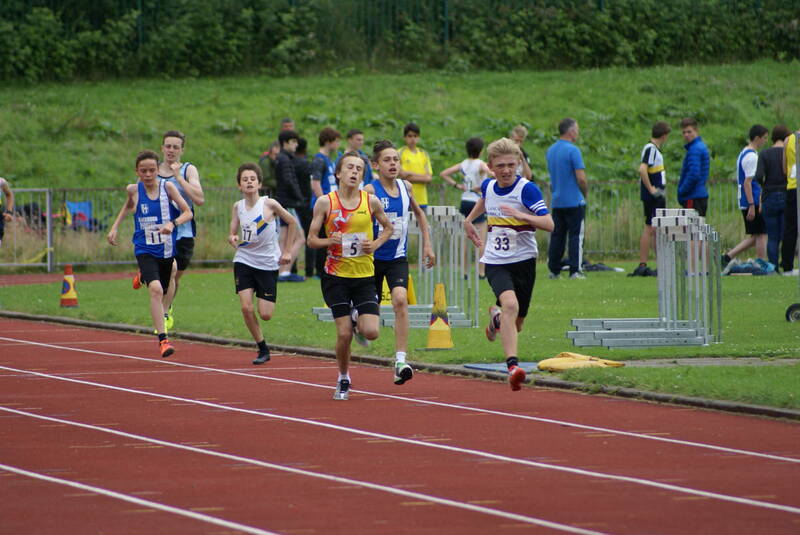 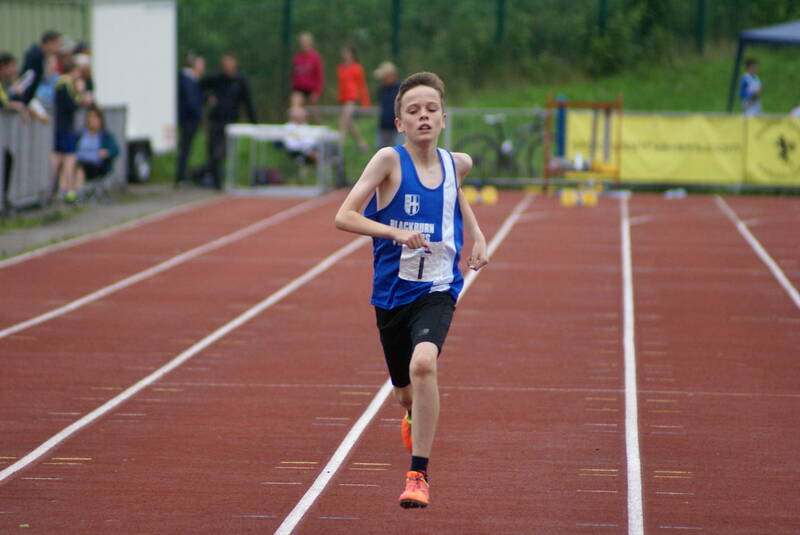 In the Sprints Ethan Barbarewicz ran the U13 ‘A’ 100m in a new PB time of 15.2 whilst George Whittaker ran 30.9 in the ‘A’ 200m and Rory Teare 32.0 in the ‘B’. 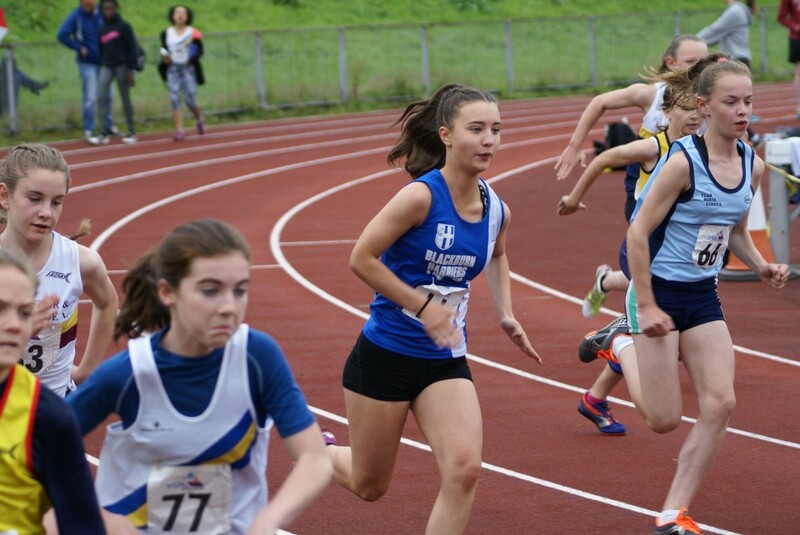 Over in the Girls U13 Sprints, first season debutants Caiden Hesketh ran 11.4 in the ‘A’ 75m and Abigail Armas posted a time of 11.3 in the ‘B’ which was a new PB for her. 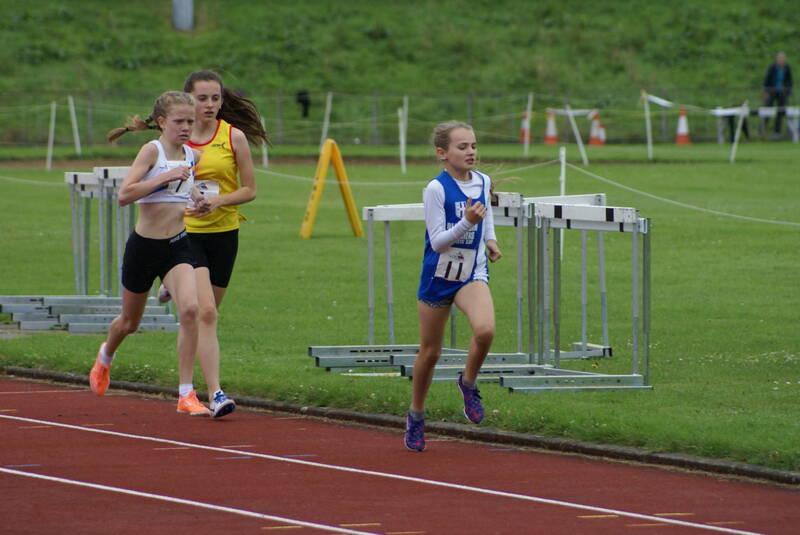 The same two girls lined up in the 150m which saw Caiden set another new PB in the ‘A’ with a time of 21.6 (4th), half a second faster and Abigail running the distance for the first time running well for 4th spot in 22.2. 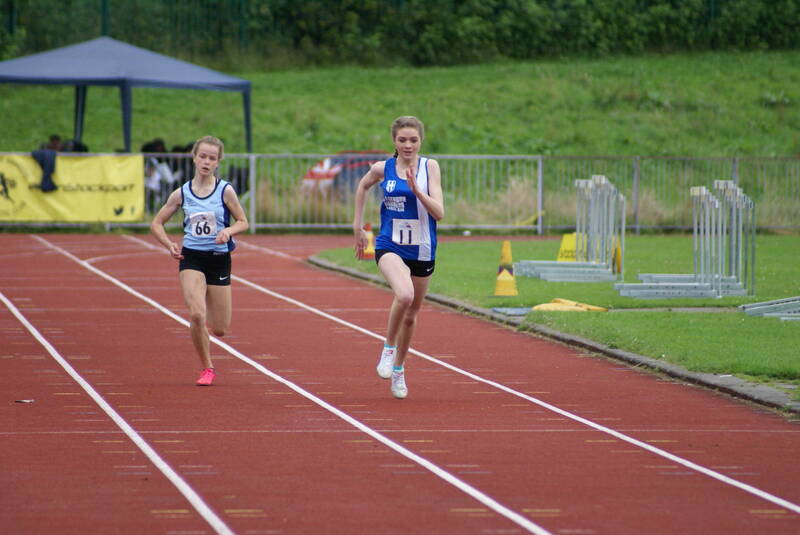 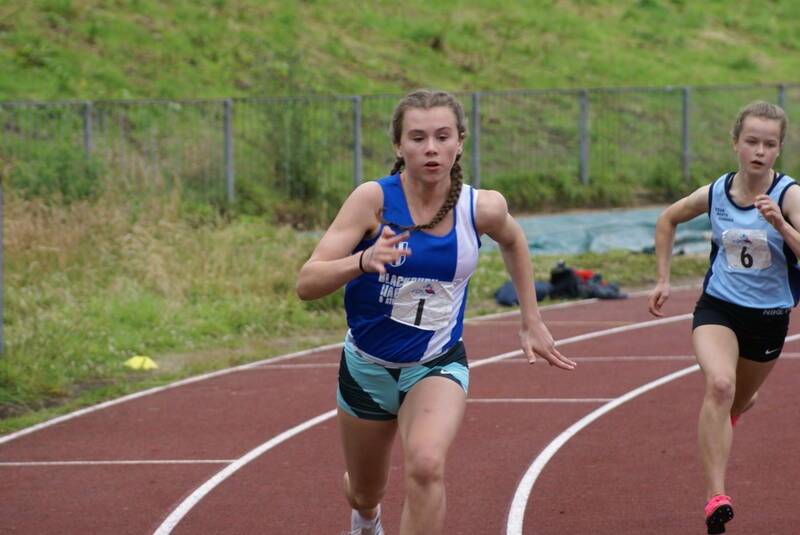 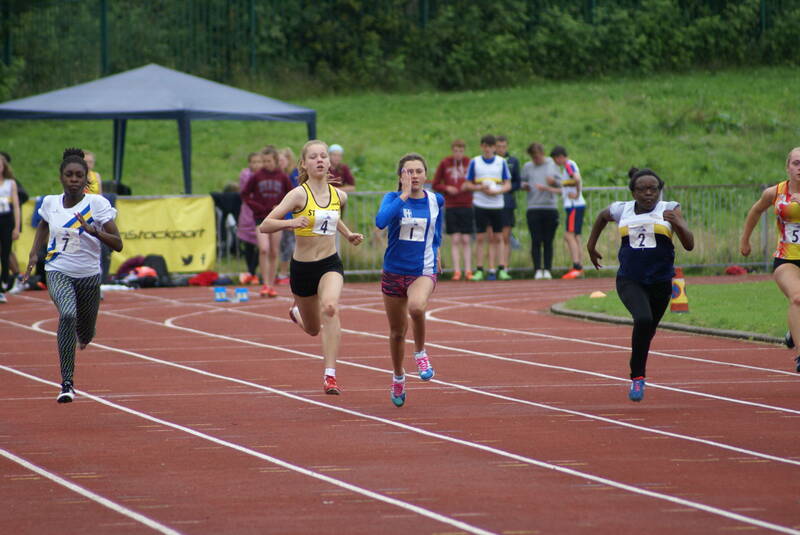 Emily Raine equaled her season’s best in the ‘A’ U15 100m (13.8) in 5th whilst Charlotte Richardson in her first outing this season over the distance ran a solid ‘B’ 13.5 in 2nd place. In the U15 200m Emily Warren took 3rd spot in 28.0 and it was a welcome return to competition for Olivia Blow who has had been injured for quite a while in the ‘B’ 200 running 30.3 in 5th place. 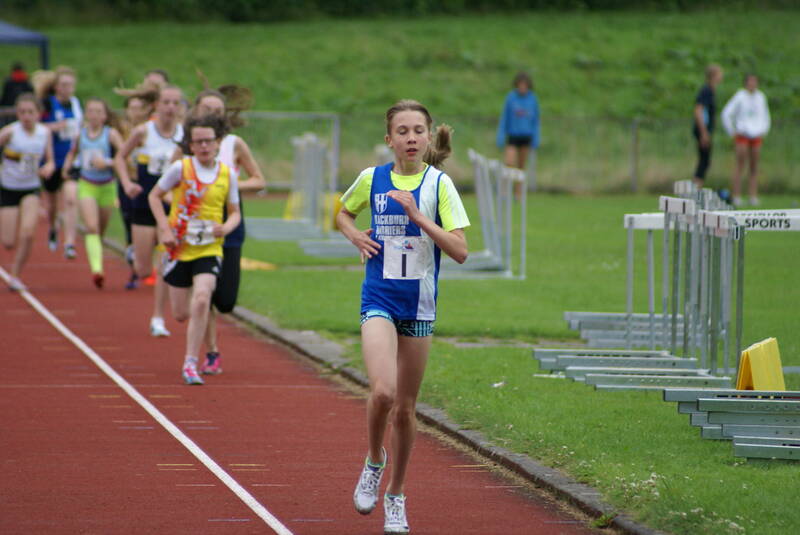 This was a new PB for Olivia by one tenth and considering she hasn’t competed since September 2015, that was a great comeback for her. 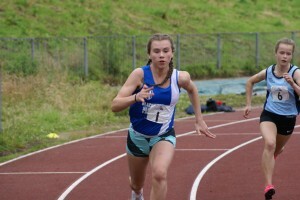 Olivia then ran the 300m ‘A’ in a time of 49.5 (7th) and her first time ever over that distance. 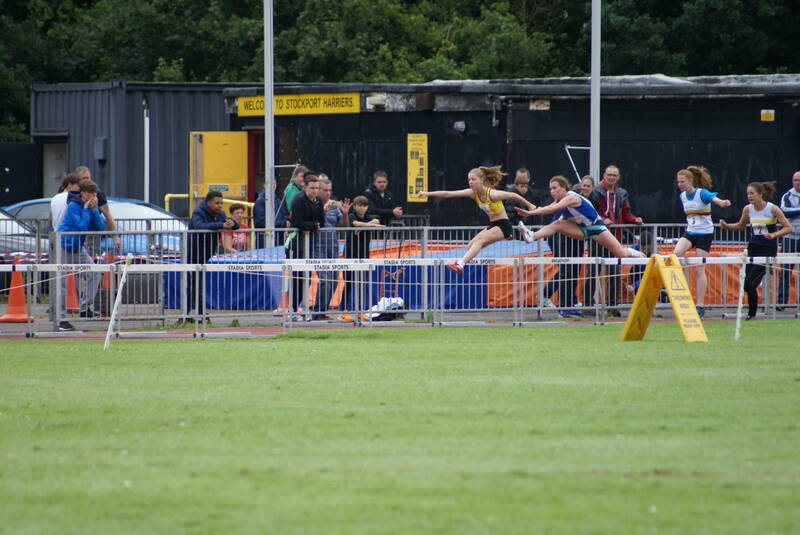 She then went and set a new PB in the Long Jump clearing a distance of 3.89m bettering her previous best by 17cms. 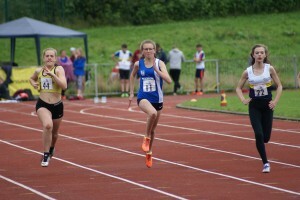 Bailey Madden who told the Team Manager she couldn’t run the distance had a great run in the 300 ‘B’ race finishing 2nd with a time of 46.4.